Minecraft Creeper Green Jack O’ Lanterns! Jeepers Creepers, what big dark soulless peepers! I don’t know about you but all the kids in my neighborhood are crazy about Minecraft these days. I know Minecraft-inspired pumpkins have already been around for years but this weekend when I stopped into my local farmers market and saw green pumpkins in all shapes and sizes, I knew what I had to do for a great Minecraft Halloween. I had to get my creep on! Green pumpkins, acorn squash, 8-ball pumpkins, zucchini? 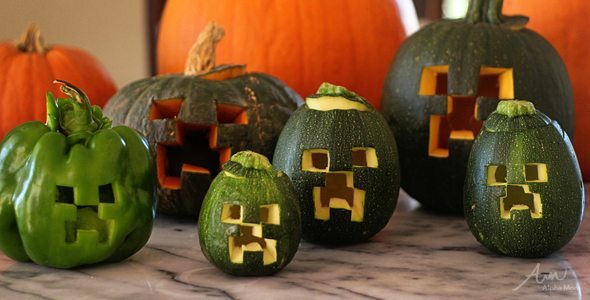 All these green vegetables were crying out to be carved into Minecraft Creeper-inspired Jack o’ Lanterns for Halloween. Have you seen these 8-ball zucchini squashes? They’re so cute and round. They’re just dying to be hollowed out, stuffed with seasoned ground turkey and served up for dinner. Or maybe you’re hosting a Minecraft-themed party? I think these little guys would look excellent as a table centerpiece, in the middle of a vegetable platter surrounded by carrots, tomatoes, maybe some cauliflower and broccoli and some ranch dressing. Carving zucchinis and acorn squash is very similar to carving pumpkins. You use all the same tools. Zucchinis are a little softer than pumpkins and acorn squash are a little harder. Just choose your cutting tools carefully and go slowly. If you need help with the Minecraft creeper design you can use my handy dandy Jack O’ Lantern carving template/stencil. Click her to download and print our Minecraft Creeper Jack O’ Lantern Carving Template/Stencil. Basically you want to divide up your carving surface into a 5 square by 5 square grid. Some cut-out squares are half squares so follow the pattern carefully. If you need to draw it in with a marker pen first, do that. Most water-based marker pens (not permanent markers) will rub off with a damp cloth when you are done. 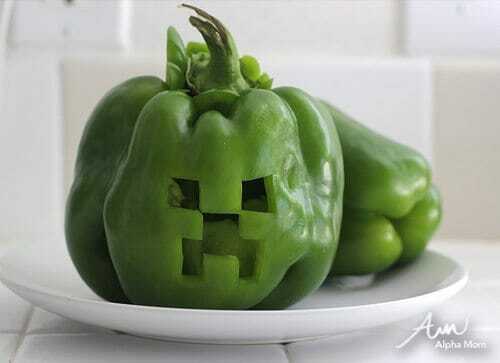 Who knows you might have so much fun you might find yourself looking for other vegetables to carve up! So yea…my boys are in LOVE with these. Thanks! AHHHHHHHHH!!!!! This is awesome; can’t wait to make some of our own! My geeky mind has been blown!